In the following list we observe the family of Niccolo III. d'Este, according to our question, which persons might have influenced the situation from the first of January 1441. Some researchers express the opinion (Pizzagalli), that Niccolo had around 300 children (which seems to be exagerated, but we are not near enough in our conditions of observation). We couldn't detect so much, the general talking is about 19, which might have had some importance. 1. Ugo, [by Stella dei Tolomei detta dell'Assasino]* 1405, +beheaded at Ferrara 1425, in 1441 dead. But present together with Parisina Malatesta, his stepmother, as a dark shadow for all family development (Story of Ugo and Parisina). 2. Meliaduse [by Caterina del Medici? 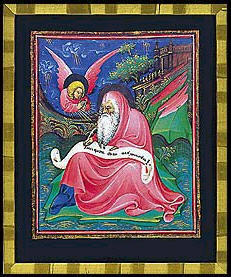 mor di Taddeo] Meliaduse, Abbot of Pomposa and Ferrara, *1406, +1452. He appears as friend of Alberti, who was an important humanist at the court of Ferrara in Leonello's time (Alberti). 3. Leonello [by Stella dell´Assassino] Signore ereditario di Modena, Ferrara e Reggio (1441-50), etc. *Ferrara 21.12.1407, +Palazzo di Belriguarde 1.10.1450. 2m: 1444 Maria (+1449) an illegitimate daughter of King Alfonso V of Aragon. In 1441 he was a young widower in the age of 33 and the exspected heir of Ferrara and possible husband-in-spe to Bianca Maria Visconti. 4. Margherita, (birthyear is unclear), m. Galeotto II Roberto Malatesta, Signore de Rimini; her husband had become with 12 years in age heir of Rimini (1427) after the death of Pandolfo Malatesta, probably the marriage happened around that time. Reports sound, as if the marriage wasn't consumated; the young Galeotto turned into religious feelings and was as ruler not usable, in 1432 he abdicted and became a Franciscan monk and died soon after. The church reacted to his unusual behaviour by declaring him a "Beato" ("blessed"). With militaric force the younger half-brother Sigismondo Malatesta fought his way to establish his rulership and earned early fame as Condottieri, which became his major occupation in the rest of his life; he married a Parisina daughter then, after a connection to a daughter of Carmagnola had become uninteresting cause the execution of Carmagnola (Carmagnola was a famous condottieri, first in the service of Filippo Maria, then of Venetia; he was assused of treason and killed). The poet Boiardo (Tarocchi poem) had later difficulties with the Pio-family (Margherita was dead then). Most genealogical tables even doesn't know her, she appears only, when researching in detail. One of her (? - or her husband) sons was beheaded at Castelvecchio in Ferrara 17-10-1469. It is unclear, if she lived at Ferrara in 1441. Considering "Margheritas virginity", which in consequence caused Galleotto Roberto's short reignment (1427 - 1432) in context to Parisinas "everybody-shocking-death" shortly before (1425), we get a feeling, what psychologically in this "teenager-marriage" might have had happened. 5. Borso [by Stella dell´Assassino], Signore in Ferrara in 1450 - 1471, Duke of Modena and Reggio from 1452 on, Duke in Ferrara in 1471, successor of his brother Leonello. *1413, + Ferrara 1471, in 1441 in the age of 26. He stayed unmarried until death for unknown reasons (perhaps fear of death, another suggestion aims at homosexuality). He tried in this time successless the business as condottiero and was captured after a battle with big losses against Sforza (battle of Soncino, June 1440) short before Maria Bianca's visit, it is unclear, if he was already released at the time of her visit. 6. Alberto, *1415, + (probably dead before birth of Alberto 2, eventually already dead before 1421, birth of Alberto Carlo), earlier presentations didn't realise, that there were 2 persons with the same name; in 1441 probably dead. 7. Gurone, Abbot, +1484; he left an illegitimate son; in 1441 probably already in functions of the church. 8./9. Ginevra [by Parisina] *24.3.1419, twin; married 1433 Sigismondo Pandolfo Malatesta, died (possibly killed by her husband) in October 1440; the news should have reached Ferrara in late October 1440 during Bianca Marias visit and should have influenced the mood of all persons present. 8./9. Luzia [by Parisina] *24.3.1419 (twin), +28.6.1437; m.1437 Carlo Gonzaga, Signore di Sabbioneta (+21.12.1450); in 1441 dead nearly for 3 years, she died short after the marriage and "the whole court mourned"; her husband Carlo Gonzaga, the new widower, fighting at Filippo Maria Visconti's side, might had become Bianca Maria's husband and was a serious candidate, when the Filippo-Francesco-alliance was in dispute. After the death of Leonello's wife, however, in 1439, Leonello seems to have been the more promising husband-in-spe, or Carlo discarded his chances, when he became prisoner in the recent Venetian-Milanese wars (battle of Tenno/Castel Romana, November 1439). 10. Alberto Carlo [by Parisina] *1421, +aged 21 days, in 1441 dead. 1m: Oddantonio da Montefeltro, Cte d'Urbino (*1425 +1444); the husband is murdered short after the marriage, the regency is taken by the young Federico Montefeltro, who later becomes a successful condittiero, duke of Urbino and a famous book-collector and protector of the arts (he's involved in the development of Ludovico Lazzarelli and the Mantegna Tarocchi. Nonetheless of this later positive development the murder case is a great scandal in 1444 (murder in 1444). 2m: 1446 Stefano Frangipani, Cte di Segni (= István, Ct of Veglia and Modrus, Bán of Croatia, +1481; Bán is the title of a regent of Croatia inside the Hungarian kingdom). The only son of the marriage, Bernát, married before 1476 Luisa Marzona d'Aragona, that is a daughter of the sister of Leonello d'Este's second wife (marriage 1445). Some concrete arguments from the familiary situation of the Aragons and the general Trionfi development make it plausible, that the Bernát/Luisa marriage was involved in Trionfi customs and possibly in the development of Trionfi cards (Dokument 32, Dokument 33 and the known descriptions of other Aragon daughter marriages around this time: Eleanore d'Aragon - Ercole d'Este 1473; Beatrice d'Aragon - Matthias Corvinus, king of Hungary 1476; Camilla Marzano d'Aragona - Costanzo Sforza 1475 (Luisa's sister)). The Frangipani were an old Roman family, an early branch of it wandered to Croatia. It might be, that Isotta's second marriage opened (or revived) an important diplomatic Italian way to Hungary (a Ferrarese girl, an earlier Beatrice d'Este, had married in 1235 the Hungarian king Andrew II; her grandson much later became Hungarian king himself, reigning 1290 - 1301); it followed, that the young Janus Pannonius (* 1434) of North Croatia studied in Leonello's and Borso's Ferrara and became a famous poet, who even impressed Cosimo di Medici at the occasion of a visit. In 1459 he became bishop in Hungary, the related Aragon family married 1476 a daughter to the king of Hungary and cardinal Ippolito d'Este as a young man visited Hungary 1493 and asked for a Tarocchi play in a letter to his mother. By this way Hungary developed an own form of early renaissance (Virtues in Hungary). Isotta had nearly the same age as Bianca Maria Visconti - this makes her a very interesting person for the situation of December/January 1441. She is in my opinion a second candidate as object of the Pisanello picture (it's also suggested in art history, that the picture was done 1443/1444). 12. Beatrice, *9th of April 1427, + before 29.11.1497; she married with 21 years (that's comparatively late) 7th of October 1448 Niccolo di Correggio, who died one year later (11th of July, 1449). She had a son of him, born after the death of the father, with the same name: Niccolo di Correggio. He was educated in Ferrara (even after the mother left to Milan) and became a great poet, theatre-organizer, warrior and courtier with an adventurous life and a complex biography, rather important for the early development of theatre (as the d'Este court became one of the most modern courts in Europe, theatre developed first forms here - this beside the great contribution of the court to the development of music and poetry and literature generally - Boiardo, Ariost, Tasso). In 1455 (or 1454) Beatrice married Tristano Sforza (an elder son of Francesco Sforza's earlier relations before Bianca Maria), thus generating a stable link between the Este and Sforza families. Tristano got the role of a Sforzian chief diplomat in the course of time (likely with some education at the d'Este court) and Beatrice became a second grande dame in Bianca Maria's Milan (long before the other Beatrice d'Este - a niece to the older by the brother Ercole d'Este - made her very famous appearance in Milan as wife of Lodovico Sforza near to the end of the century and near to the end of the great time of the Sforza). Her life became difficult under Galeazzo's reign (since 1466), cause the relations Ferrara-Milan cooled down. Galeazzo forbade her to have contact to her sonthen. After Galeazzo Maria's death (1476) and the death of her husband (1477) she influenced in a critical situation the widow Bona of Savoy to pass the reignment from Simonetta to Lodovico Sforza in 1478 - this caused deciding political changes in the state of Milan with Lodovico as the first man in the state. From her it is known, that she was in her youth "the queen of the feasts in Ferrara" and that Bianca Maria danced at her wedding (with the involvement of famous dance-masters). It became a proverb, that "seeing Beatrice d'Este dance would be like being in paradize". In the time of the younger Beatrice d'Este (1475 - 1497) in Milan, wife of Lodovico Sforza, the elder Beatrice d'Este still was living in Sforza Castle with splendid rooms and in honoured position. She arranged a party at the birth of the son of the younger Beatrice. I seems evident, that Beatrice and Bianca Maria Visconti (nearly same age) were great friends and this should go back to Bianca Maria's stay in Ferrara in winter 1440/1441. She survived Bianca Maria more than 25 years. 13. Camilla, unclear year of birth, married 1448 Rodolpho Varano di Camarino (+1464), in 1441 perhaps 8 - 12 years old. The Varano family was involved in the biography of Lazzarelli and it seems, that Lazzarelli might have met Borso d'Este 1471 at the court of Camerino on Borso's famous journey to Rome (Mantegna Tarocchi). The description of a daughter of the house praises the court as full of joy and games - cards are explicitely mentioned. The relations between Este and Varano court were still vivid in later times. In 1441 Ercole is in the age of 9 - and he gets in July 1442 a Trionfi deck. After the marriage of Leonello with a daughter of Alfonso of Aragon Ercole with his younger brother Sigismondo was send for education to the court of Naples and returned late ca. 1460. He became duke of Ferrara and Modena and Reggio after the death of his brother Borso in 1471, which gave reason for a conflict with Leonello's son of the marriage to the Gonzaga daughter, Niccolo. Niccolo tried a riot by surprize in 1476 and was consequently beheaded together with many of his cooperators. 15. Sigismondo, Signore di San Martino, *1433, +Ferrara 1507; married Pizzocara N. in 1441 in the age of 7 - gets in July 1442 together with Ercole a Trionfi deck, has later as adult occasionally greater losses by gambling. 16. Albert (2) + 1508, unclear age in 1441; the 3rd Albert in the family. In 1476, in the reignment of Ercole, he is the 3rd best paid person at the court, so he is not unimportant (Sigismondo - legitime son - got about 2000 Lira Marchesana, Albert - illegitime son - got 800, but 800 was a huge sum, 10 times as much as a very high official could expect and 400 - 800 times much more than a humble servant got in a month). 17. Rinaldo, [by Anna de Roberti] abbot of S.Maria della Pomposa, Signore di Ostellato, * Ferrara ca. 1435, +Ferrara 1503; m.1495 Lucrezia of Montferrato (*1468 +1508), in 1441 probably 5 years old. 18. Bianca Maria, [by Anna de Roberti] *1440, + Mirandola 1506 m.1468 Galeotto I Pico della Mirandola (+1499) born during Bianca Marias visit; she is important, cause Bianca Maria became godmother. She got a careful education - likely protected by the far godmother Bianca Maria and got a splendid marriage at the Pico court. 19. Orsina, m. 1. Aldobrandino Rangoni, 2. ... Malatesta, 3. Andrea Gualetti, unclear age. I heard further of a son Fulco connected to the year 1433, of a daughter Viridis, which became a nun (Fulco and Viridis are names used in the older Este family) and of a second or third Margherita (married to a Francesschino in Verona). Francesco, Leonello's illegitime son, born ca. 1430, so in 1441 ca. 11 years old and in a similar age as Ercole and Sigismondo (and probably Alberto). He was sent in 1445 to the court of Burgund as quasi-diplomat, but also for "educative reasons", probably disturbing with his presence the new marriage of Leonello or the rights of the legitime son of Leonello, Niccolo. 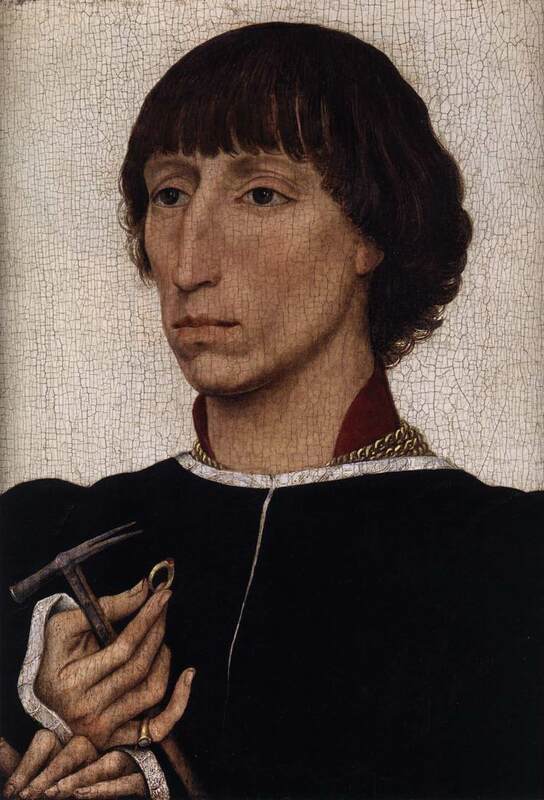 Francesco was painted by Roger van Weyden at the court in Burgund, a famous portrait. Niccolo, Leonellos motherless son out of his first marriage, ca. 1 1/2 years old. Children are "nice and attractive" in this age, especially for 15 years old girls, one shouldn't overlook this. Also present are possibly the mothers of Niccolos children, especially Ricciarde de Saluzzo (at least 23 years old), perhaps a little depressed cause of the infidelity of her husband and because she didn't get children since 1433 (she becomes "difficult" after the death of Niccolo, claiming rights to her own sons). Nearer to Bianca Maria should have been the active mistress Anna de Roberti (at least 20 years old), attractive especially because she is pregnant and gets the child, to which Bianca Maria becomes godmather. As life is known, young girls do love such matters. It should be considered, that there are possibly much more children and much more mothers of children in the distance or nearby with some influence upon the situation. Also it should be considered, that some of the persons mentioned might have lived outside the court. Also it should be considered, that Bianca Maria perhaps had some persons in her company. Also servants with different functions, some administrators, some teachers (it is unclear, if Guarino is still involved), persons with special functions like artists, singers in the capella etc.., also visitors of various sorts, men for the military functions etc.. It was estimated, that the court of the Sforza, also with many children, consisted out of 800 persons - probably one has to assume for Ferrara a smaller number, but also many persons. The number 600 is given for 1476, in 1441, when the court didn't have reached its peak, it might have been some less. The number of students of the university increased in Ferrara with Leonellos activities from 30 to about 300, one can learn from it, that it was an expanding time, the court developed, it was not always the same situation. Two persons in the age, where they do have much attraction, especially to 15-years-old girls: Niccolo, who possibly could become Bianca Marias step-son, a motherless child, and Bianca Maria, the babe, to whome Bianca Maria Visconti becomes god-mother. Probably (at least) 2-3 female persons of similar age as Bianca Maria, perhaps some more in younger age: Isotta, same age, Beatrice, 2 years younger but of special importance, cause it's she, who becomes later associated with creativity. Possibly Anna de Roberti in interesting position, further other girl friends or court ladies and female pages of Isotta and Beatrice from Ferrara and court ladies or female pages accompanying Bianca Maria. The female dominance at the Ferrarese court might have been so, that it was actually probably no problem to have around 10 of them in similar age together for a "party at night" at the 1st of January - perhaps without men. Of course: Where are the men? Two lonesome young men, Leonello, 33, and Borso, 27, both probably concerned with work in the administration and military problems, also engaged to develop their hobbies, art, music, literature, philosophy etc., with probably not too much time to engage strongly in all this young-women-children actions. Gurone and Meliaduse had functions in the church. Niccolo III., mostly active in high diplomacy, probably often not at home, and, if, then some time must have been taken to produce new children. Also present: the war between Venetia and Milano, perhaps not felt very much in Ferrara, and actually the winter was spend rather peaceful by the opponent parties, both sides preparing the next steps in spring. Also present: the death of Ginevra, Parisinas daughter. The news might have reached Ferrara in October, when Bianca Maria had just arrived. But Ginevra had left home 7 years ago, so some of the members of the family didn't know her, probably, some had difficulties to remember anything of her and only few might have seen the really dark tragedy around her and the whole family, none of the marriages of the older children of Niccolo endured a longer time. In 1441 Margheritas husband was gone, Luzia and Ginevra are dead, and Leonellos wife also had died. Leonello, old enough, at least must have seen it a little bit. Remarkable is the love for singing in Ferrara in Leonellos time. There are enough children in Ferrara: Children love singing and there were enough children. When Borso later reigned, the children were grown-ups. Borso prefered instrumental music - and had no wife and no children.